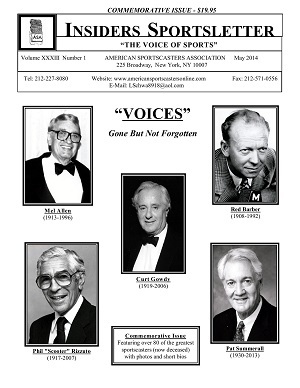 As a special promotion, the ASA is offering an exclusive "Commemorative Issue" of our Insiders Sportsletter, “Voices- Gone But Not Forgotten,” which features bios and photos of over 80 of the greatest sportscasters who are no longer with us, but whose contributions have left an indelible mark on our profession. Some of the legendary sportscasters included in this issue are pioneers such as Harold Arlin, who in 1921 broadcast the first baseball game over Pittsburgh's KDKA Radio, Graham McNamee, who brought major sporting events like the Rose Bowl and the World Series to a national audience, and Bill Stern, who was the first announcer viewers saw when NBC televised its first-ever sports event, a college baseball match up between Princeton and Columbia, in 1939. Not to mention some of the greats that I had the pleasure of knowing personally like Mel Allen, Red Barber, Jack Brickhouse, Jack Buck, Don Dunphy, Curt Gowdy, Marty Glickman and Chris Schenkel. They were not only giants in the broadcast booth, but they were bright, articulate, and personable away from the mike as well. 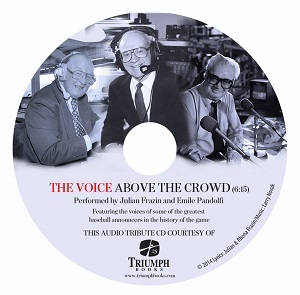 Also included in this package is a wonderful CD, “The Voice Above the Crowd,” an exclusive audio tribute to sportscasters, courtesy of ASA and Triumph Books. This gift, with a suggested retail value of over $25, is being offered to our friends at Linkedin for a special price of only $6.95, which includes postage and handling. Supplies are limited so it will be shipped on a first-come, first-serve basis. If interested, please click on the "Buy Now" button below.